Microscope World offers student microscopes that are ruggedized to take everyday classroom use, yet allow your students to observe a range of objects. The easy-on-the-budget, student-proofed microscopes are also equipped to prevent the loss of parts so you aren't constantly ordering replacements. Choose a digital microscope with student and teacher software which will allow students to view a specimen via an attached viewing screen (Android tablet cameras are available!) or attach the video output to a PC for classroom viewing. Cordless student microscopes are also available with battery operated LED illumination and rechargeable batteries. 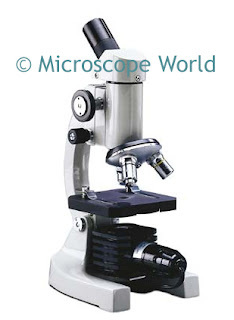 Microscope World's dissection microscopes for students are available in cordless, single or dual magnification as well as stereo zoom microscope models. For help choosing the right student microscope within your budget, contact us to speak with a knowledgeable microscope representative.